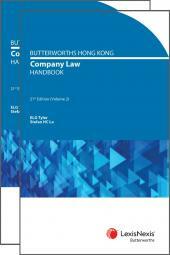 The contents of Butterworths Hong Kong Company Law Handbook details the remaining Parts from the old Companies Ordinance (Cap 32) that have not been repealed. The Butterworths Hong Kong Company Law (Winding Up and Miscellaneous Provisions) Handbook details the remaining Parts from the ‘old Companies Ordinance’ (Cap 32) that have not been repealed, and thus not included in the New Companies Ordinance. Provisions relating to prospectus, companies winding up rules, insolvency of companies, disqualification of directors, receivership, restrictions on sale of shares and provisions relating to the Societies Ordinance are still in force under the now retitled Companies (Winding Up and Miscellaneous Provisions) Ordinance (Cap 32). 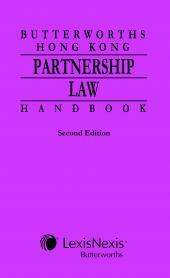 This Handbook reproduces the text of the Ordinance as currently in force, together with details on all amendments and repeals with section by section annotations, encompassing significant judicial decisions and rules of court, as well as history notes, definitions of words and phrases, discussions on practical aspects and contentious issues in reference to each section and other authoritative materials including cross jurisdictional references. 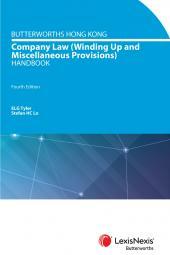 Since the last edition of this book, Cap 32 has been amended to incorporate all changes made by the Companies (Winding Up and Miscellaneous Provisions) (Amendment) Ordinance 2016, which commenced operation on 13 February 2017. 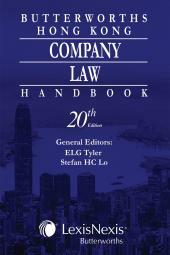 The contents of this Handbook were annotated and reviewed by ELG Tyler and Stefan HC Lo, both of whom were part of the Companies Ordinance rewrite team. ELG Tyler has also written an extensive introduction to the Ordinance, highlighting the significant provisions of Cap 32. This series has been cited with authority in over one hundred court cases in the Hong Kong Court of First Instance, Court of Appeal and Court of Final Appeal. This Handbook will be an invaluable source of information for practitioners, legal advisers, company secretaries, students and anyone interested in the laws governing companies in Hong Kong.